Upholstered furniture always traps dirt, dust, and oils in its fabric. Vacuuming is always a good start, but it doesn’t get quite deep enough to clean out everything. Chem-Dry’s natural deep upholstery cleaning brings out the unwanted dirt from the base of the fabric. The refreshing clean cuts down on bacteria and odors in your home and lets you enjoy your comfy spots much more! How It Works: We clean furniture and upholstery with a carbonation solution that lifts dirt and soil to the surface of the fabric. Once the contaminants are lifted to the surface, our powerful equipment whisks them away, without damaging any part of your furniture. Hot Carbonated Extraction is our secret. These green certified solutions penetrate deep into the upholstery, literally exploding dust & dirt off the surface. After this, we use hot water extraction to whisk away dirt particles and ensure a thorough clean. We use 80% less water and yet we clean deeper than other upholstery cleaners in Reno and the surrounding areas. Chem-Dry’s safe, non-toxic solutions actually help your sofas, love seats, couches & chairs stay as clean as when they were brand new. Chem-Dry’s HCE process removes an average of 99.1% of common household allergens from upholstery. When paired with a sanitizer, it removes an average of 89% of the airborne bacteria in the home, improving indoor air quality. Contact us today to learn more, or schedule your next visit online today with Chem-Dry of Northern Nevada! 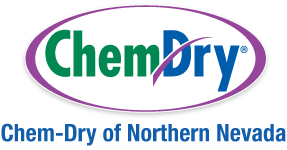 Schedule an Appointment with Chem-Dry of Northern Nevada Today!